On the 13-Feb-2018, Lippo Malls Indonesia Retail Trust (LMIRT) released their FY2017 full year results. Immediately the next day, OCBC Investment Research kept its “Buy” call on LMIRT. However just 5 days later, they shockingly changed their position and view on LMIRT and issued a downgrade to “Hold”. The revised estimate comes with a 10% reduction in the price of LMIRT. What prompted the change in the call is unclear. However what is clear is that blindly following analyst calls without doing your own due diligence is a big no no. Analyst themselves sometimes get it wrong or in this instance, changed their stance. I am sure that those who had followed OCBC Investment Research’s call on 14-Feb and bought into LMIRT would be rather upset after seeing the chance of stance on 19-Feb. 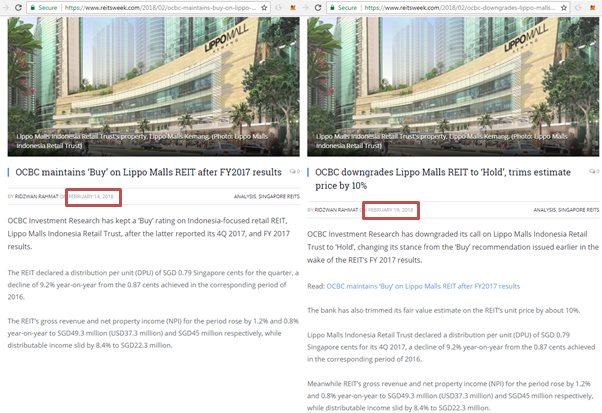 The reported change of stance by OCBC Investment Research is taken from online newsource REITs Week (https://www.reitsweek.com). 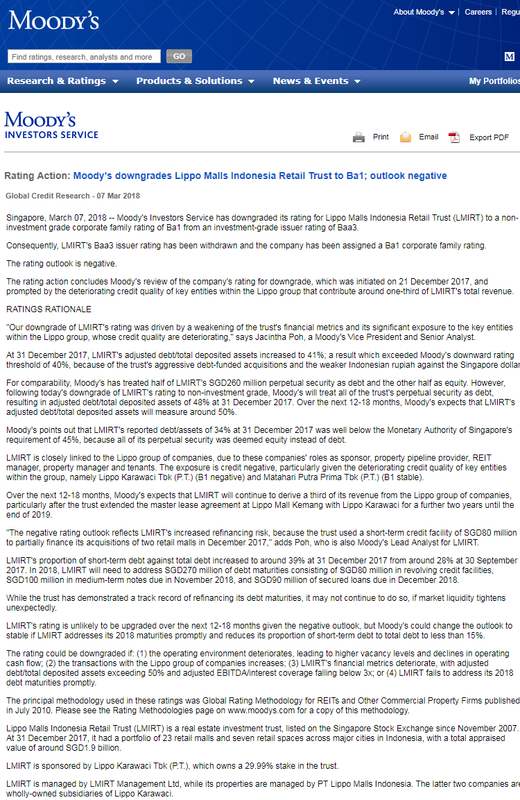 On 21-Dec-2017, Moody's Investors Service has released a statement stating that it is reviewing LMIRT for the purpose of downgrading its Baa3 rating. LMIRT's "Baa3" rating is the lowest investment-grade rating by Moody's, any downgrade would bring LMIRT into the junk status. 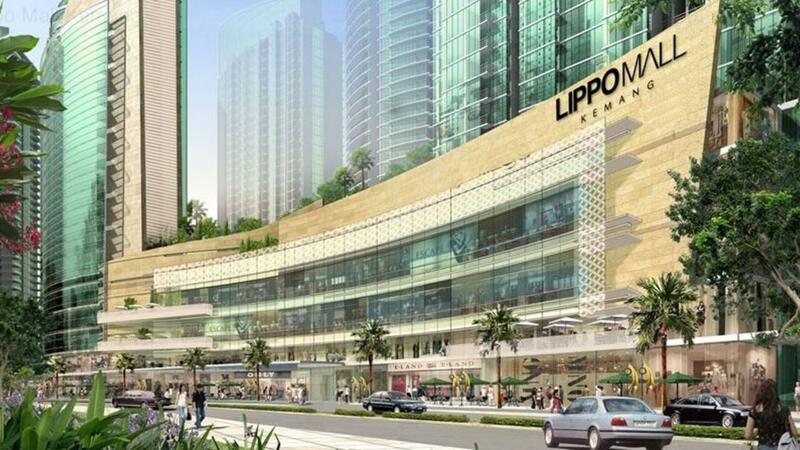 The credit rating agency cited the deteriorating credit quality of key entities within the Lippo group, which contribute around one-third of the trust's revenue. Poor ratings will usually lead to higher interest cost to be paid on future borrowings, refinancing and bond issuance. Moody’s finally hammered the nail on 07-Mar-2018 confirming the downgrade to junk status. The extract from Moody’s statement is shown in the image below. A quick check of LMIRT’s in the presentation slides show that its gearing stands at 33.7%. This seems quite reasonable. Or is it? 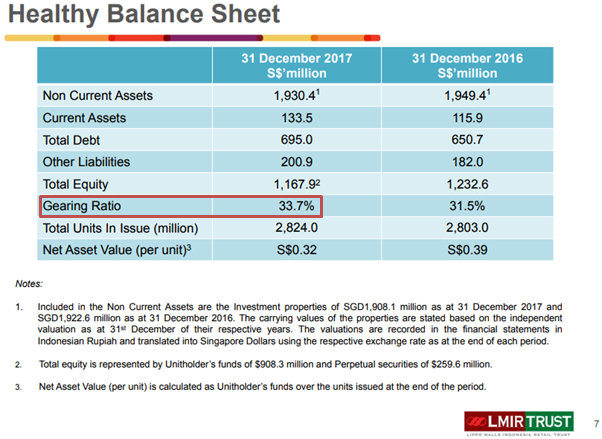 Upon closer investigation of its Balance Sheet, we found that LMIRT also has a significant amount of perpetual securities. In fact, the amount of perpetual securities had increased by about $120mil from FY2016 to FY2017. A quick check on its announcement section revealed that it issued about $120mil worth of subordinated perpetual securities yielding 6.60% per annum in Jun-2017. Prior to this issuance, LMIRT has already issued $140mil worth of subordinated perpetual securities yielding 7.00% per annum in Nov-2016. Collectively, this would incur a total of $17.72mil ($7.92mil + $9.80mil) per annum cost to LMIRT. This is on top of the interest payments that it would need to make on its debts. According to the Cash Flow Statement, LMIRT paid a total of $35.861mil in interest for FY2017. This would imply that LMIRT’s interest cost on all its debt obligations amounts to almost $53.6mil per annum. 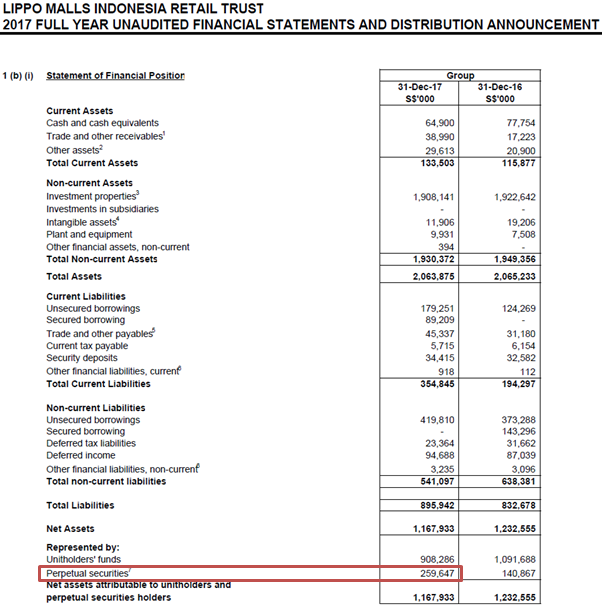 From the balance sheet, the LMIRT’s total debts amount to $688.27mil excluding an additional $259.64mil worth of perpetual securities. If perpetual securities are included, it would bump up LMIRT’s gearing from 33.3% to 45.9%! That would mean that its debt level would have already crossed the regulatory limit of 45.0% for REITs. From the statement of total return, we found that LMIRT has a net property income (NPI) of $184.25mil. Given that LMIRT had made payments of $35.86mil in interest in FY2017, its interest coverage ratio stands at 5.14x. However if the payments on the perpetual securities are included, then its interest coverage ratio will fall to 3.44x. This is a very low interest cover as it would mean that close to 30% of the NPI was spent to service cost of debts. There would be much less left over for investors after other expenses are paid. 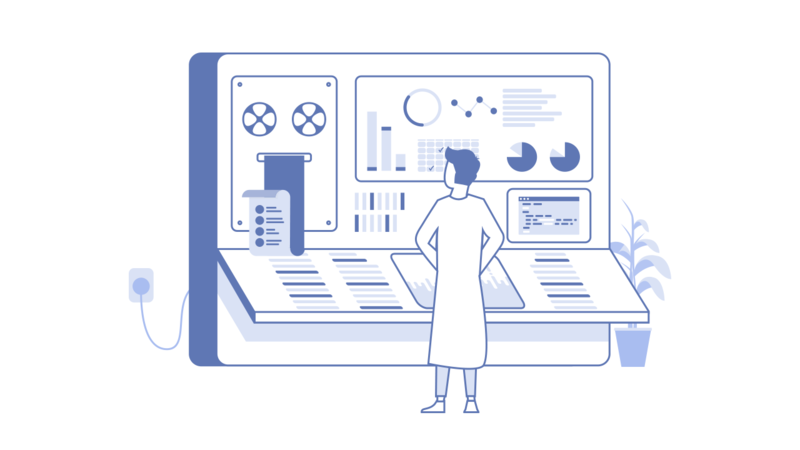 Perpetual securities are also a form of debt and should be taken into consideration when doing our analysis. 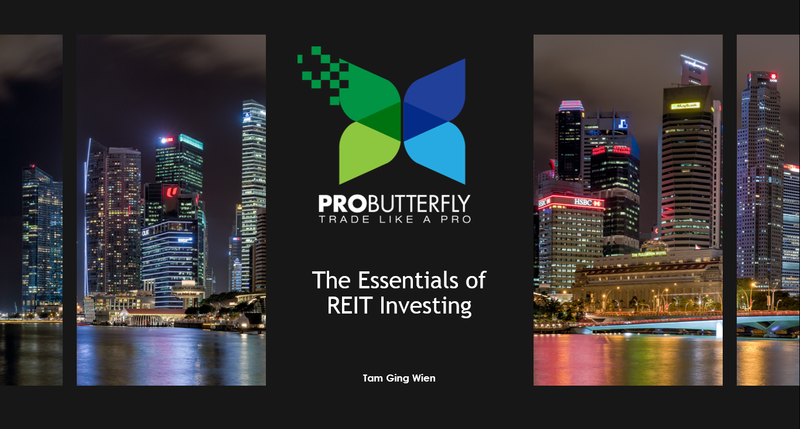 While under accounting rules, they do not impact gearing, perpetuals incur interest to the issuer and impacts the DPU of REITs. 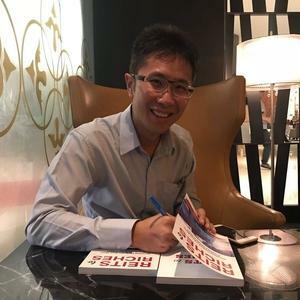 The author at time of writing does not owns shares in Lippo Malls Indonesia Retail Trust.